Meet Dahlia Finger: twenty-nine, depressed, whip-smart, occasionally affable, bracingly honest, resolutely single, and perennially unemployed. She spends her days stoned in front of the TV, watching the same movies repeatedly, like “a form of prayer.” But when Dahlia’s so-called life is upended by a terminal brain tumor, she must work toward reluctant emotional reckoning with the aid of a questionable self-help guide. Stunned, she obsessively revisits the myriad heartbreaks, disappointments, rages, and regrets that comprise the story of her life. With her take-no-prisoners perspective, her depressive humor, and her extreme vulnerability, Dahlia Finger walks a dazzling line between gravitas and irreverence, compassion and candor, high and low culture. This staggering portrait of an anti-heroine’s death confirms Elisa Albert as a “witty, incisive” (Variety) and even “wonder-inducing” writer (Time Out New York). 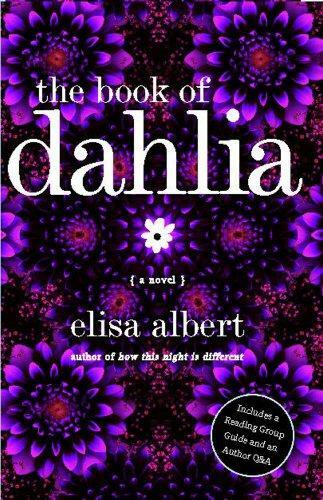 Elisa Albert is the author of the short story collection How This Night is Different and the novel The Book of Dahlia. She is currently editing an anthology about sibling relationships called Freud’s Blind Spot, to be published in 2010. Albert is a founding editor of Jewcy.com and an adjunct assistant professor of creative writing at Columbia University. What was your initial impression of Dahlia? Did your opinion change as the story progressed and significant details about her life experience were revealed? Why or why not? What do you think about the idea that a positive attitude is the most important ingredient for a happy, healthy life? Why does Dahlia resist this theory, and what does it tell us about her? Do you think Dahlia’s attitude “dooms” her? Many of us have had experiences with cancer, either personally or in our families. In our experiences, how has this dictate to be “positive” affected us and our loved ones? Is there a part of us that wants to kick and scream and complain and feel sorry for ourselves, even though we know it’s not productive? Discuss your own experiences with illness. Does illness transform us? Why or why not? “Sure, the situation was bad, but Dahlia felt free, freer than ever, to do what she did best: muck around in the heinous reality of it. She was unimpeachable. She could say and think and feel whatever she wanted. She had cancer!” (p. 40). On some level is Dahlia a little bit glad to have this terminal illness? Does she believe it lends weight and shape and meaning and confirmation to her enormous unhappiness? Dahlia spends a lot of her time watching television, often viewing the same movies on cable over and over again. Why is watching familiar movies “a kind of prayer” (p. 6) for Dahlia? Discuss Dahlia’s relationship with her brother, Danny. What compels her to pursue a relationship with him for so many years despite his thoughtless cruelty to her? What does her persistent devotion to and adoration for Danny tell us about her? Why, then, do you think Dahlia refuses to forgive Danny even on her deathbed? “A vile, self-absorbed, depressing, lazy, messy, spoiled, f—ed-up, probably mentally ill loser dies. So what?” muses The Book of Dahlia (p. 252). How would you answer one of the novel’s central questions: Is a seemingly “wasted” life worth mourning? If you found her difficult to like in general, are there nevertheless things about Dahlia that you do find sympathetic? Can you think of some emotional or psychological ways in which Dahlia does indeed triumph? When we encounter a character with whom we don’t totally identify, what can we learn about ourselves from our reactions? What do you think is useful about art (literature, music, film, painting, photography) that is “depressing” or full of angst and pain? What do you gain from looking at or reading or watching or listening to a work of art that is sad or unpleasant as opposed to cheerful and uplifting? Do you think we can learn from “depressing” art, or should we want to see only happy things? What do you think the narrator means in calling Dahlia’s story a “litmus test” (p. 252)? Do you think you passed or failed this test and why? If Dahlia made you feel judgmental or unsympathetic, discuss how and why you dislike her. In what ways does a character like Dahlia make us confront our own fears and regrets? What role has resentment played in your own life, and how have you conquered it or struggled to conquer it? Discuss a time in your life when you were bogged down in negative emotions, and talk about how you got through it. Given the choice to wallow in self-pity, anger, and resentment or take charge of our lives and let go of the past, how and why are we sometimes able to choose the latter? What makes a person strong enough to “Choose Life” versus someone who is unable to do so? How do you think our society as a whole deals with death? Are you satisfied or dissatisfied with the cultural and religious ideas about death that you’ve encountered? What are your own attitudes about and notions of death? How have these changed throughout your life? Is it something you think about often? Why or why not?